Here’s something to consider as you book your travel plans for 2017: JetBlue is now offering free in-flight Wi-Fi on all domestic flights. JetBlue recently announced that it’s finished rolling out its “always-free and speedy” in-flight Wi-Fi to each of its 227 planes throughout the U.S.
JetBlue is now “the only airline to offer free, high-speed Wi-Fi, live TV and movies for all customers on every plane,” said Jamie Perry, vice president of marketing at JetBlue. Other airlines in the U.S. still charge for Wi-Fi use aboard their aircraft. American Airlines and Delta offer daily Wi-Fi passes for $16, while Southwest charges $8 per device. Called Fly-Fi (because duh), the new Wi-Fi service is available from gate to gate, meaning passengers don’t need to wait until the plane reaches a cruising altitude to connect. Instead, travelers are free to use their devices from the moment they board the plane. This means you no longer have to memorize the seat-back brochures while you wait for takeoff — just board the plane, toss your bag in the overhead bin and start answering those emails (as soon as you climb over that grumpy guy in the aisle seat who refuses to stand up). JetBlue promises speeds of up to 20 Mbps per device — which is impressive considering there can be upward of 200 devices connected at any one time. Anything you would normally do on the internet (tweet, post, upload, stream — even shop for groceries online so that they’re waiting for you when you get home) you can now do during your flight. Passengers will also be able to stream Amazon Video to their devices and can even earn points for every eligible dollar spent on Amazon while on board. JetBlue also boasts several other in-flight perks, including 36 channels of free DIRECTV, audio/visual on demand touch screens featuring blockbuster movies and crewmember picks, extra legroom, and free snacks and drinks. 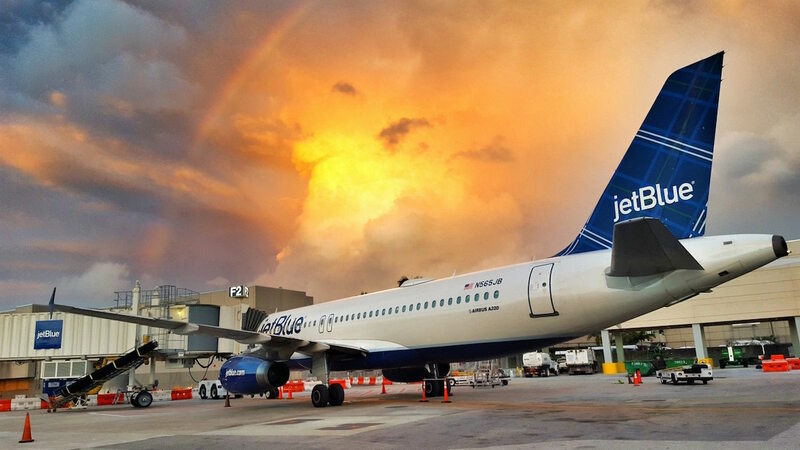 JetBlue is definitely on the right path — and you have to wonder if this will persuade other airlines to follow suit. I mean, a roomy(er) flight where I can binge-watch my favorite shows while eating free food? That sounds like my next vacation. Your Turn: What in-flight perk would you like to see more airlines offer? Grace Schweizer is a junior writer at The Penny Hoarder. She’s going to stay put in sunny Florida until this winter nonsense is over.